I've been hard at work responding to users and making small changes to Grooveshark. While the rest of the team is working diligently at improving the major aspects of the backend and the application itself, I've been working on Desktop shortcuts, releasing the External Control API, as well as some crossfade fixes (coming next release). To enable the API, users must goto Desktop Options. External Player Control API (Docs) allows developers to design apps that control Grooveshark from outside Grooveshark. This could be a remote iPhone app, a Firefox/Chrome extension, a remote control or anything where it benefits users to not have Grooveshark Desktop (this will not yet work for the Flash version) open. 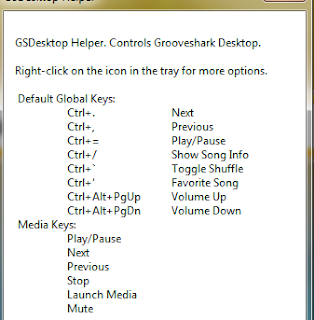 The first applications to benefit from the External Player Control API are Desktop hotkeys. Between Terin Stock and myself we developed official Windows and Mac clients to listen and enable global shortcuts. These would enable Grooveshark to have shortcuts no matter what window you have focused/open. Both apps will allow you to define your own keys as well as incorporate a better UI in coming versions. You can read more about the Desktop shortcuts on Jay Paroline's blog. Along with the above released features, I've been hard at work improving the crossfade feature that many users have come to enjoy. In the next version, you will be able to enable Fade in/out on pausing and resuming. Also, there will be come fixes coming that will enable crossfade while Frowning a song and removing songs from your queue.